Productivity is a biggie on the social web. Twitter is full of people sharing tips on how to be more productive and efficient. Shouldn’t they be doing something useful? Maybe they’re just taking a break. Either way, if you strive to make more efficient use of your time and haven’t already heard of the Pomodoro Technique, you should take a look at it now – (here’s a really great cheat-sheet). It’s not new. In fact it was created in 1992 by Francesco Cirillo who went right ahead and created an impressive technique based around the simple kitchen timer. His timer was shaped like a tomato, hence the name Pomodoro! The time management technique is stunningly simple… as are many of the best ideas. It’s all about focusing your work efforts in timed 25 minute chunks, with a 5 minute break in between each burst of activity. During each 25 minute ‘pomodoro’ the emphasis is on solid concentration with zero distractions. Easier than it sounds, eh? After four pomodoros you get to take a longer 15-20 minute break and then it’s back to it, until you’ve completed the target number of pomodoros you’ve set for yourself that day. Whilst it is certainly simple and very easy to explain, it is also surprisingly effective. The Pomodoro technique has won thousands of followers around the world. Unsurprisingly, since the launch of Apple iTunes App Store, several iPhone apps have hit the market to help Pomodoro fans keep the focus. Pomodoro Time Management [iTunes Link] is 99c/59p although a Lite version is also available for free [iTunes link]. The app combines a to do list with a simple but effective pomorodo timer, which counts down your 25 minute bursts of activity and slots in those 5 minute breaks in between. The app keeps track of the number of pomodoros you’ve completed in a day and let’s you tick off those tasks you have completed within each timed session. The Pomodoro technique is all about trying to keep interruptions to an absolute minimum. This can be difficult, especially for those new to the technique or working in hectic environments. Unfortunately, this app doesn’t allow you to pause your work mid-way though a pomodoro. 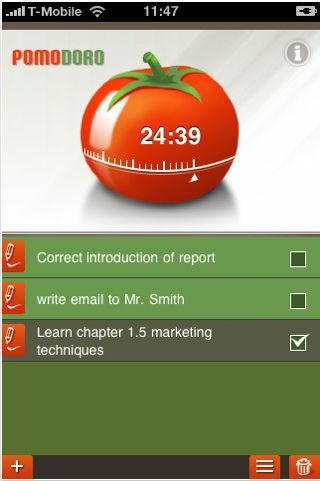 Pomodoro Pro [iTunes link] is priced at $2.49/£1.79 and leaves the tomato-related imagery behind at the name. It offers a slick looking timer which counts down pomodoros and inserts breaks. 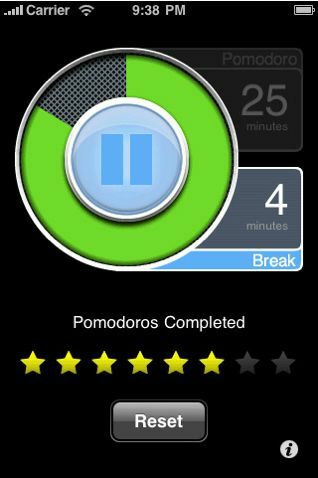 This app enables you to pause the timer during pomodoros and even offers the opportunity to adjust the times of both the pomodoros themselves and the long and short breaks, thus allowing you to customise both the app and the technique. I tried out this app and was surprised that whilst a five minute break automatically began to count down after the first pomodoro, I needed to manually restart the timer to kick-off the second pomodoro… I didn’t notice this and had to guess how much time I’d been diligently working before noticing that the clock wasn’t ticking. 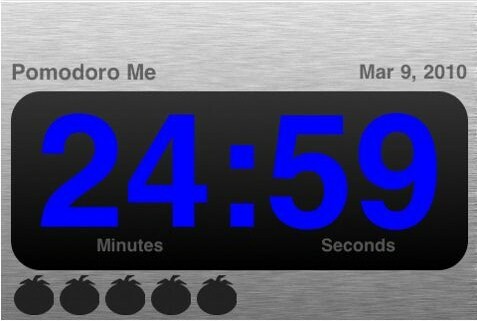 Next up, Pomodoro Me is a free app [iTunes link] which applies a brushed chrome look’n’feel to the timer app. Completed pomodoros are notched up under the timer using silhouetted tomatoes. This is another app which let’s you set specific times for each pomodoro. 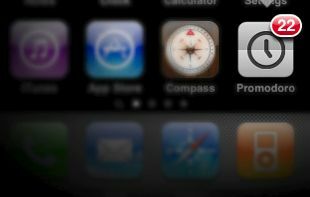 The next app, Promodoro is 99c/59p and offers much the same functionality as the others apps [iTunes link]. 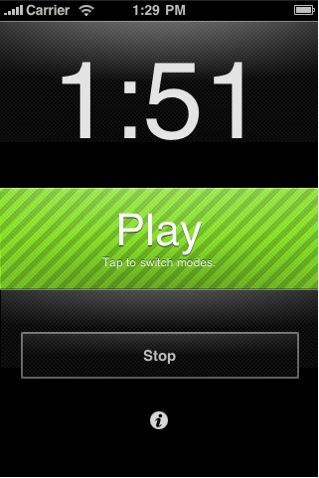 In the case of Promodoro though, the app can be closed without stopping the timer, presenting you with a badge announcing the number of minutes left alongside the app’s icon on your iPhone homescreen. Tenplustwo, [iTunes link] takes the Pomodoro concept of 25 minute periods of work interspersed with 5 minute breaks to an extreme. Aimed at those with really short spans of concentration, Tenplustwo advocates 10 minute periods of work, broken up with 2 minute bursts of fun. This is an intriguing new app and it remains to be seen just how much fun you can have in two minutes! Still, it’s free for now, so it might be worth a look. What is definitely worth a look though is the Pomodoro technique itself. As well as the cheat sheet linked to at the top of this post, Francesco Cirillo’s complete book on the technique is available for download as a PDF under Creative Commons license. Right… I need a break. Read next: Lazyfeed changes the way the Internet comes to you.